Terra Sigilatta is produced using a simple sedimentation process. A clay is slurried in lots of water and allowed to settle. The fine, unsettled portion (or upper part the the sediment) is extracted and concentrated to produce the terra sigilatta slurry. It is applied to the surface of terra cotta ware (and optionally burnished). When fired it produces gloss even though no glaze (or glass development) is present. This low-fire process has a long history among indigenous cultures. Read about it at Wikipedia or search on google.com. Potters commonly experiment with the raw clays and ball clays at their disposal in search of a desired fired effect that couples with application properties they can tolerate or adapt. Redart, for example, is a common material in North America that has been found to readily sediment into layers of differing particle sizes. Ball clays produce terrasigs of widely varying character even though their plasticities and fired maturity as raw materials can be quite similar. Deflocculants are often employed to help accelerate the sedimentation process. The difficulty in achieving a gloss surface often gives potters renewed respect for ancient and indigenous cultures that perfected the process. Terra Sigillata can flake or crack off ware during drying and firing (especially if applied more thickly). Thus it needs to have a drying and firing shrinkage similar to the body. And EBCT test can be used to determine the compatibility. If it is flaking off during drying (as evidenced by the EBCT bar bending toward the body during drying), then add some bentonite to increase drying shrinkage. If the EBCT bar bends toward the terrasig it may be necessary to calcine some of it to reduce drying shrinkage. If it flakes off during firing (the EBCT bar bends toward the body) then add some feldspar or a Frit to make it more vitreous. If the EBCT bar bends toward the terrasig during firing then you will need to add something refractory to reduce its maturity (e.g. calcined alumina is available in very fine particle sizes). There is an interesting scientific side to the process (pointed out to us by Juan Figueroa Dorrego). Sedimentation of free falling particles in water follows Stokes Law. The law predicts the speed of the particle sedimentation based on size. According to an article by Sonja S. Singer (Industrial Ceramics - London, 1963 - Chapman & Hall Ltd.), in 20 hours a 2 micron particle will settle 20-25 cm. That means that the height of the container is important. If it is too shallow significant amounts of the finer particles could sediment on the bottom. The gloss on this low fire red clay is not the product of a glaze or any kind of glass development. It is from a layer of incredibly fine clay on the surface (a process called Terra Sigillata). It is the product of a lengthy research project by Monika. She investigated many materials, techniques, clay bodies and firing schedules. 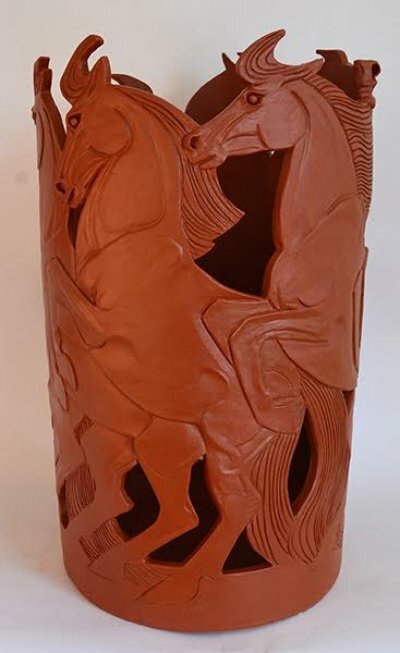 Can terra cotta ware resist an open flame? Yes. This is a road-side stand in Mexico in 2016. 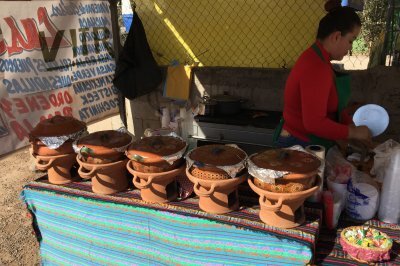 Each of these "cazuelas" (casseroles) have a flame under them to keep the food inside warm. The pedestal is unglazed. The ware is thick and heavy. The casseroles are hand decorated with under glaze slip colors and a very thin layer of lead glaze is painted over (producing a terra sigilatta type appearance, but with brush stoke texture). These have been made and used here for hundreds years. How can they not crack over an open flame? The flame is small. The clay is fired as low or lower than potters in Canada or the US would even fired their bisque. It is porous, open and able to absorb the stresses. They know these pieces are not strong, so they treat them with care.